In December 2017, PensionBee reported £100m in assets under management (AUM), alongside its announcement that State Street, one of the world’s largest financial institutions, had taken a strategic minority stake in the London-based fintech company. Overall, since its launch just two years ago, PensionBee has grown to be in the top three of digital wealth managers based on U.K assets under management. PensionBee has been a vocal proponent of consumer switching rights and the speed of pension transfers from legacy pension providers to PensionBee has increased considerably, helping to accelerate PensionBee’s growth in AUM. 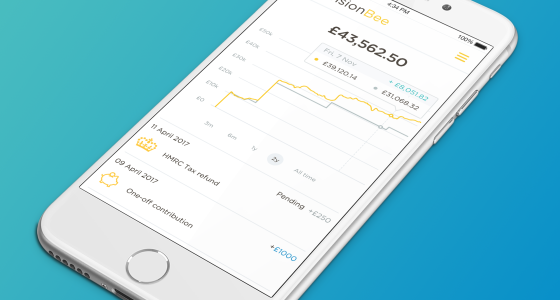 After several smaller pensions are combined into a PensionBee plan, a typical customer will have a starting balance of £25,000. The average age of a customer has steadily risen from 37 in 2016 to 43 and the product increasingly appeals to mature customers in their late 40s and 50s, who are looking for a modern alternative to a traditional Self Invested Personal Pension (SIPP). PensionBee is also pleased to announce the promotion of Jasper Martens to Chief Marketing Officer. Martens has been VP Marketing at PensionBee since inception, originally joining from insurance provider Simply Business.